An elite force of soldiers that operates beyond the boundaries of any law. They are shadows, waiting for the perfect time to strike. 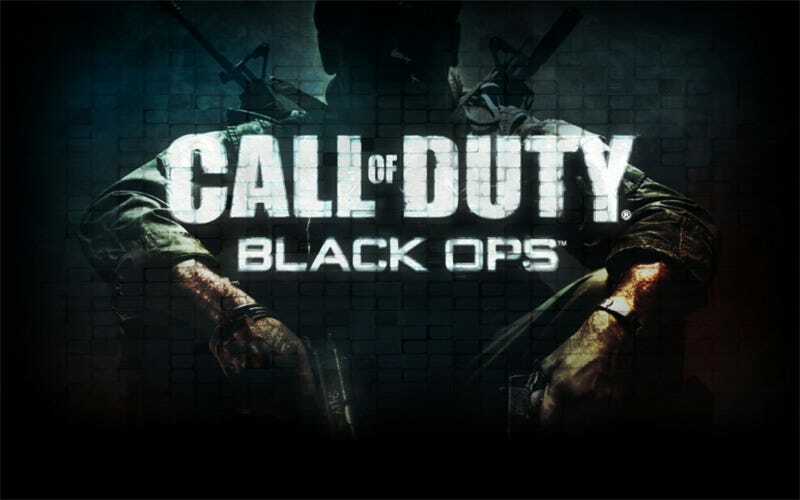 They are the assembled video game critics, and this is the Call of Duty: Black Ops Frankenreview. There's a new Call of Duty game in stores, and regardless of what the critics say it will sell ridiculously well. As a sporadic video game critic myself, I would have taken this opportunity to write a review made up of random nonsensical phrases. For instance, "Call of Duty: Black Ops' main problem is a giraffe ordering a soy latte." That's probably why I didn't wind up reviewing Call of Duty: Black Ops, and these folks did. You begin the game as Alex Mason, a soldier being interrogated for information that he can't remember. You play through Mason's memories in search for information. Sam Worthington, Ed Harris, and Gary Oldman deliver expert performances and really nail their respective characters. There are twists, some of which work better than others, and the plot seems to get bogged down and slightly disjointed towards the middle. But unlike Modern Warfare 2, Black Ops does a wonderful job of cleaning everything up for the finale. As you work your way through fifteen levels, there are several points where both the objective and placement of the enemies can only be categorized as unfair. One section in Vietnam in particular puts you in a difficult spot as the enemies infinitely respawn until you finally figure out what needs to happen. Unfortunately, your HUD doesn't tell you what to do and unless you're watching your AI counterparts very closely, you're going to get stuck. I died countless times trying to work my way down this particular hillside and grew increasingly frustrated as the objective just wasn't clear. Even after I arrived on the checkpoint marked on the map, nothing happened and I was left in the open to die in front of my friends. But we know the sole selling point of Black Ops for the majority of fans is multiplayer. So we're delighted to inform you that it's an absolute blast to play online. We put countless hours in to the various competitive and co-operative game modes with everything unlocked - and it's clear that naysayers will struggle to be disappointed by Trearch's online offering. (Unless you're the most picky of all deathmatchers. Or we've missed some massive exploits.) Plenty of decent maps and an arsenal of meaty and powerful Modern Warfare-esque weapons (the Dragon's Breath shotgun scares us) ensure that the core Black Ops modes feel very familiar to Infinity Ward's game. The new Wager Matches are an interesting twist as well, letting you bet credits against your own performance; rank in the top three and you earn credits, rank anywhere else and you lose credits. These matches will no doubt be dominated by high level players the way poker games are usually dominated by card sharks, but even amateur gamblers can have fun thanks to the three tiers of betting. The lowest tier, Ante Up, only requires a 10 credit buy in, which is a modest enough entry fee to entice anyone to give it a try; the modes themselves are fun, with One in the Chamber and Gun Game topping my own personal list, and even though I never felt particularly thrilled by the gambling aspect, ending a round ‘in the money' does lend a nice element of accomplishment to the experience. Call of Duty: Black Ops is a powerful story. The game's missions explore a fascinating time in history, take us to places we've likely never been and put us in situations unusual and captivating, even for a video game. But what it does best, through both narrative and gameplay, is tell a story. As the game progressed I found myself anticipating the cut-scenes as much as I did the tightly crafted levels. Thinking back, I can easily forget whether the last absorbing moments of the game were played by me or for me. This is what video games should be, a confusion of interaction and story-telling, of graphics and camera movement, of play and parable. Can the series get any better at this point?